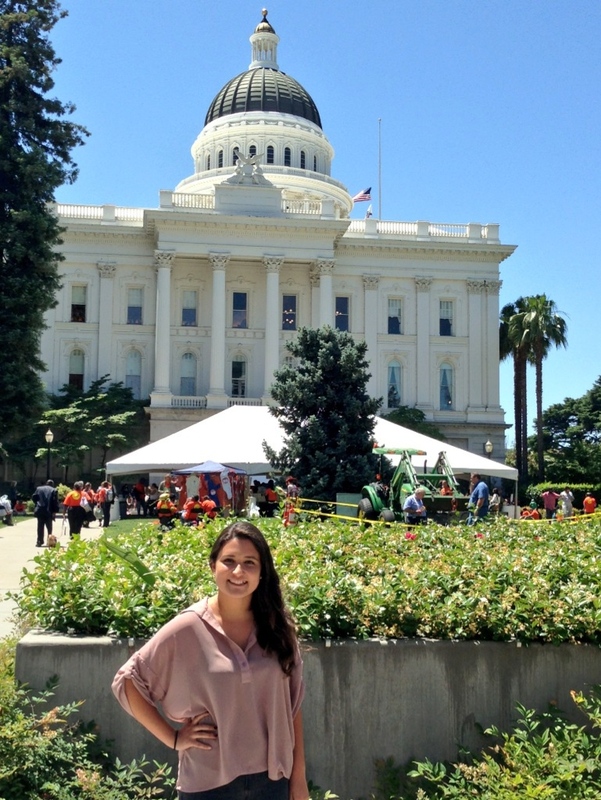 This past Wednesday I flew up to Sacramento as a part of the San Diego Delegation joining hundreds of others at the Capitol for "Hunger Action Day." 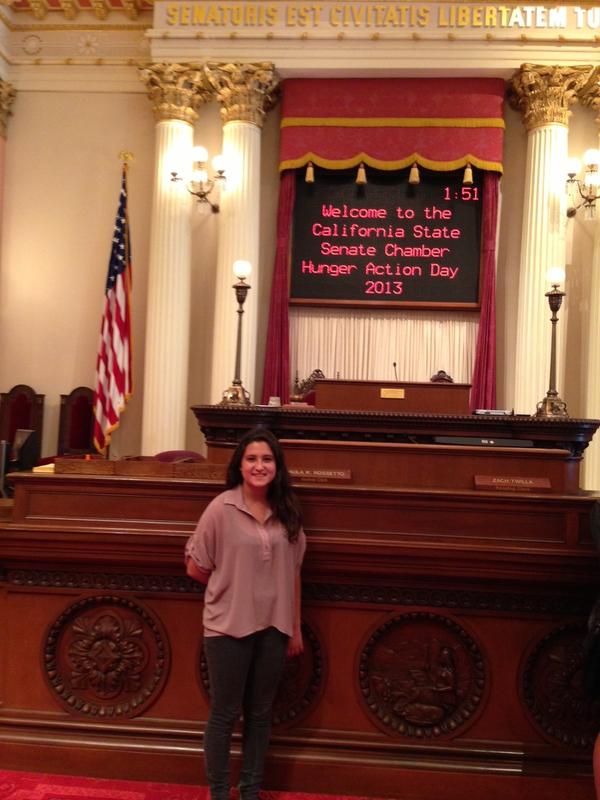 Once a year, organizations and citizens lobby elected leaders about legislation that would help fight hunger in California. My teen-run organization, Donate Don't Dump, is a part of The San Diego Advocacy Coalition as is Feeding America, The San Diego Food Bank, Catholic Charities, North County Food Bank, Jewish Family Services, and dozens of other big names in hunger relief in San Diego. This is my second year advocating in Sacramento on behalf of the hungry and environment, but this year we had legislation that we co-sponsored. Now being 16 and co-sponsoring legislation is a pretty amazing experience. It's hard not to get excited humming School House Rock's, "I'm Just a Bill, yes I'm only a bill and I'm sitting here on Capitol Hill... "
In the past I've advocated to help pass "Zero Waste" Policies and California's New Recycling Law, AB341, but I've never been part of co-sponsoring legislation before. I'm not even old enough to vote yet, but there I was sitting in senators offices pitching them on legislation. My bill sitting on the steps of the Capitol building with a sad little face waiting to become law is SB134 "No Hunger For Heroes." Basically this bill would help struggling military families put food on their table. You see, that's what got me started four years ago, discovering that active military families, kids, and seniors went hungry. Like most Americans, these were not the faces I pictured when hunger was discussed. However, this is the face of hunger now across the U.S. In San Diego, there are food distributions by charities for Marines at Camp Pendleton and at Murphy Canyon Military Housing for Navy Families. Four years ago when I first found out about them I was shocked, but when I discovered how much good food that could help gets dumped in landfills instead, I was angry. That's how Donate Don't Dump got started. So to have a Senate bill that could potentially help active military families is awesome except for one thing: it's only a bill. Here is another term I've learned, "suspense file." That's a legislation limbo where bills get stuck and we didn't want our little guy going there. In order to insure your bill doesn't get trapped you need to get support and often compromises must be made. You see our bill isn't sitting outside on the steps of the capitol, it was in room 4202 where the Appropriations Committee meets. SB134 "No Hunger For Heroes" did make it past room 4202 and will be up for vote next week. As a country, voters get to decide what are the legislative priorities and where are we going to spend our tax dollars. Running a state or country isn't cheap and taxes are where the money comes in from. Just like your budget funds aren't unlimited and choices are made based on your priorities. That's were we come in; priorities are influenced by "We the People." Even if we aren't old enough to vote we can advocate and once we can vote -- look out! For me, I think we need to prioritize common sense solutions to help the environment like eliminating commercial food waste that could instead be "rescued" and donated to food banks. Food that corporations can't sell can still help alleviate hunger and it's just crazy to be clogging up landfills when you can help the hungry. Our military families sacrifice so much to keep us safe and at the very least I think we should make sure they don't worry about being able to feed their families. Memorial Day is when we think about our military heroes. Let's hope our elected leaders also vote to to ensure there is "No Hunger For Heroes."